PUPPIES! We have puppies, roly poly, cute and cuddly, adorable and precious. 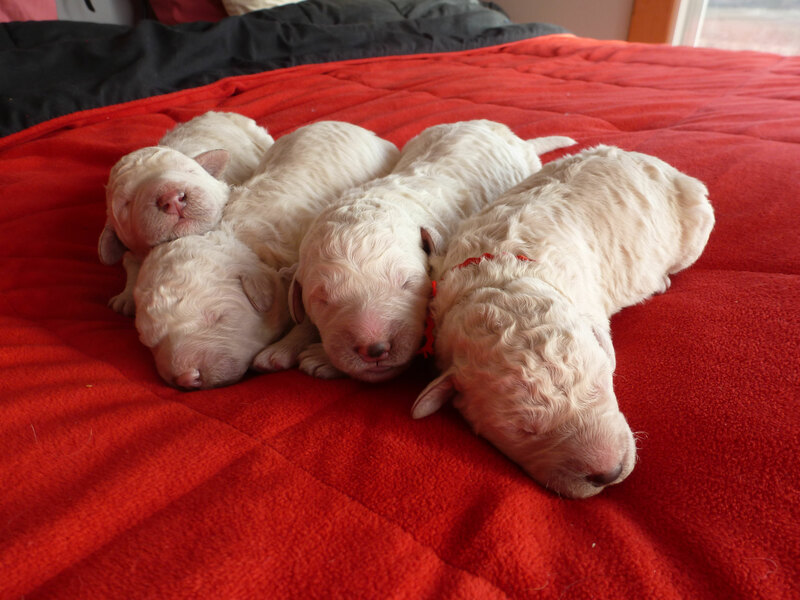 And not just any puppies but Komondor puppies! For many years I had watched the dog shows and marveled at the Komondorok as they floated around the ring. How many times did I remark, “I want one of those”? Well much has changed since I saw my first Kom on TV, changes that allowed for me to actually have one of these magnificent dogs. The biggest change is I now live on a farm that uses working dogs, the perfect place for such a dog. These are not your average dog and don’t thrive in the cities. They were breed to endure some of the worst weather that nature has to offer and defend their charge against fearsome predators. I love these dogs! I can put them in the pastures in the midst of a blizzard to fight off packs of coyotes and then turn in for the night without fear of what I will find in the morning. Nothing can do that except a LGD, not a llama or donkey or other such animal I have read about that some have claimed guard their livestock. A U.S. Marine could do it but otherwise, no. We have Great Pyrenees that handle most of the work now as we are just developing our Komondor training program so I will say something about them. They set a very high bar for our new Kom puppies to reach. Our dam is Paige, of the Montgomery Kennel as is the sire, Zenta, a Hungarian import. 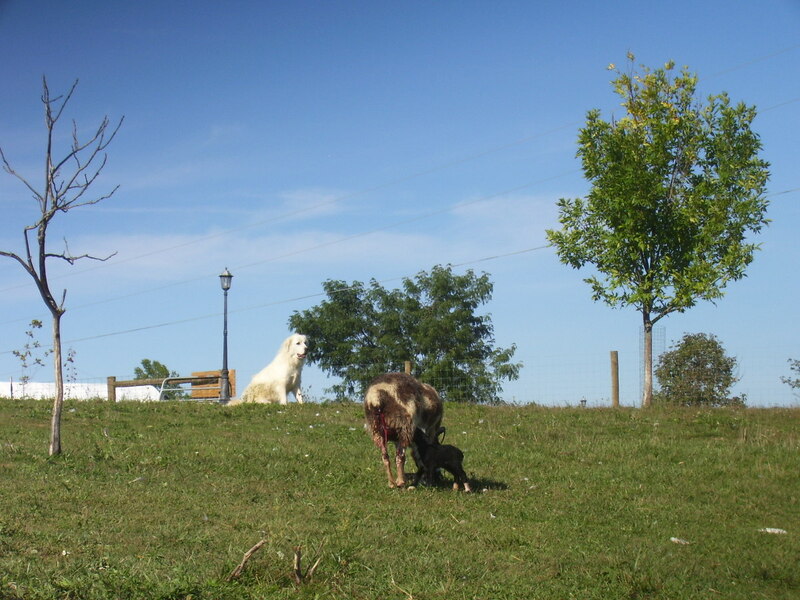 Paige is the fourth Kom to live at Cota Farms and her litter is the first born here. In addition to offering our puppies for sale, I hope to have sales of trained pups. Ideally these pups would be purchased along with the rest but remain here for an additional period for training. In this way we hope to develop a more modern training approach to livestock guard dogs. Most of the present training methods are focused on a type of sheepherding that is used less today and far less here in America. Much of the sheep production that goes on here is done on small farms or on limited acreage. There is also the likely hood of some other livestock on the premises, like chickens or geese. In the old countries the dogs may prey on these birds in an attempt to feed themselves but today dog food is abundant and so the dogs can be expected to protect everything in their domain. We have had rather good success so far. I can say that our losses under all circumstances are much less than when we did not have the dogs. I have noted the drive to attack waterfowl seems to be greater than with chickens or turkeys. This is something I will keep track of. The smaller predators that like to prey on chickens or ducks are also deterred by the presence of the dogs as we seldom find their carcasses anymore and the dogs don’t usually consume the whole animal even if they do take a bite out of it. Why do dogs hate furniture, is it jealousy? You discover your couch has been chewed and you’re still mad about the kitchen table. So you pound on your dog a little, the walls shake from your rage and the dog retreats under the bed. Thoughts of why do I need a dog creep into your mind, and I certainly don’t need two or three. You love plush carpeting, beige, but not with Rover running in and out and sweet little Cookie always goes and pees in the corner. I’ll be honest, I often hate what my dogs are doing. But if you love your dogs and cats you make allowances for such things just as you do for the people in your life. But you can’t keep replacing furniture to accommodate your animals. In general I don’t believe that altering your animals is an acceptable solution to this problem. For example, de-clawing a cat is a very serious thing to do despite the common practice. Doing this to a cat is like removing a dog’s teeth because you are afraid it may bite someone. A more reasonable approach in dealing with the animals in our lives is to make adjustments on our part. Animals are perfect and we can’t make them better. Yes, I said that, but I will explain. Animals are the culmination of a very involved process to make them exactly what they are. They are the best available solution for a life form to thrive in the given environment. We can’t even come close to doing that without our technology that allows us to survive so a little respect is due. My livestock guard dogs thrive on our farm in the dead of winter in ice and snow that would end my life in hours without the use of clothing and shelter and central heating. It is true that we have re-engineered certain animals, mainly livestock, to better serve our needs but it is no improvement for the animal itself. And we have created breeds of dogs that suite our fancy but in some cases these new animals require us to now care for them as they can no longer survive in nature or sometimes they can’t even reproduce on their own. So then, with all that in mind I have begun a project to address those areas of incompatibility that we have with our dogs, specifically, redesigning our home to better allow us the interaction with our dogs (and cats and other animals as well) that we want without sacrificing our humanity or living in filth. Yes, this is the dark side of living with animals and I have witnessed what happens when someone abandons reason and turns their home into a de facto kennel, but that is not what I am talking about here. I want to go beyond the mud room concept and create a common area for us to interact in. In times past, when people where not so far removed from the animals that we still rely on for food and other things, homes were designed in just this way. One common structure had animal quarters on the ground floor while people lived above them. I realize that my desire is not shared by most people and unfortunately many people have a sort of general contempt for all animals but they are to be pitied. In future chapters I will give details and photos of my progress toward this dog/people house. We at Cota Farms feed our dogs raw meat and we sell this same meat to others. If you search the internet for information about feeding raw meat to your dog you will not find a simple explanation about this practice. You will find opinions pro and con with lots of ideas about where dogs come from, what wild canines eat, similarities between the two, the dangers of bones impacting the colon, nutrition, bacteria, what nature intended, veterinarians opposed to the practice and so forth. Unfortunately if you give a thought to what you are feeding your dogs and question it even a little you will be pulled into this mess and have to deal with it, decide what is right for you and your dogs. I think it is important to consider the source of the information and how it may be biased. Most important is to use a little common sense! This may sound like a simple matter and maybe even a little patronizing but it certainly is not. We have been trained to not think critically and to avoid questioning any figure of authority or commercial product. Let’s take the issue of feeding bones for example. I have no doubt that some veterinarians have had to help dogs that have been over fed bones. I would bet however that they are far fewer than the number of medical doctors who have had to help people that have been over fed junk food. Raw meaty bones are not a meal and if you feed this to your dog every day you will eventually hurt your dog. Because some people out there are negligent when it comes to feeding raw bones is not an argument against giving your dog a bone. We sell bones to our customers, a variety of bones of high quality. We do not present the bones as a meal for your dog! Consider this choice, an occasional raw bone or a hunk of nylon in the shape of a bone. And of course all dogs are not the same! We have several dogs, most live outside on the farm; they are livestock guardians and have free access to 25 acres of pasture, wetland and ponds. They are a lot like wild animals if you ask me. They will at least taste almost anything and eat things so disgusting that the idea that clean raw meat is bad for them is laughable. We also have small dogs that live in the house and sleep in our bed. They are nothing like the LGDs and we don’t feed them like they are. Here is an opportunity to use a little common sense, some critical thinking. Because we don’t feed raw meat to our small dogs, nor subject them to things like Hurricane Sandy, is not an argument against feeding raw meat. By the way, our LGDs did not take that evening off; I watched them run around in the storm doing their job without any indication that they were bothered by all the weather. Since our small dogs would not have survived even one hour in that terrible storm am I then to deny the fact that my other dogs are better suited to that environment? Our small dogs are quite partial to the same food we feed all our dogs it is just that they prefer it to be cooked a little and cut into tiny bits, tender pieces please. Cota will choose my home cooked sliced kidney every time over commercial dog food. Now if I were to feed him just kidney that would not be good for him and I would be negligent – again, common sense to the rescue. I tell my customers that variety is key in feeding a raw diet. Money is also a very important factor. I have seen raw diet menus that no honest veterinarian could argue against yet they are not practical. Still there is a lot you can do by being creative. If you have a source for discount can goods that can be very helpful. For example, fish is a good food to rotate into your dog’s diet, preferably cold water fish as they have the good oils in them. A dented can of sardines or mackerel is just great. A can of pumpkin or yams mixed in now and again is good too. Raw eggs are an inexpensive item that should be on your menu. Our dogs eat more eggs than most as they live on a farm and are not opposed to self-service. We sell raw meat for your dog’s diet; it is not a complete or balanced diet but does make for some good meals. We are pleased to offer a variety of basic food at a price far lower than any we have seen. We encourage our customers to seek out additional foods for their dogs, as best as they can afford and if you find a good source for gazelle pancreas please share it with the rest of us. How you feed your dogs in winter is important if they are outside dogs. Most of our dogs are outside and are true working dogs. I consider them employees working security for the farm and account for them that way for business purposes. They are better treated than most employees; in addition to enjoying a superior cuisine, they get free health care, housing, acres of recreational space, a healthy social life, and internet access. Not all dogs should be kept outdoors in winter in Ohio; they are just not adapted for it. Our outside dogs are made for harsh winter weather and in fact do better in the winter than the high heat of the summer months. In summer we feed meat right from the refrigerator to help cool them down. In winter we increase their rations by as much as 50% when the weather is particularly bad. Interestingly this is the same thing we do with our livestock, something a farmer once told me. Even in the snow and bitter cold they hardly ever take shelter but they do need good food and enough of it to keep warm and healthy. In a natural diet they would eat fresh kill which would be warm. Since we feed raw meat we don’t really want to warm it up in the microwave as that would defeat the purpose so we mix hot rice with it to take the chill off. Some of you already mix rice with your food and that is fine and so the opportunity is there to give your dogs something warm to eat when it is freezing cold. It is a little extra work to cook the rice before each feeding so that it is still warm but there are some things I do to make it a little easier. I have discovered that if you use a crock pot to cook your rice, with some alterations in the amount of water to rice ratio and the different settings on the crock pot, you can start it in the morning and your rice will be ready at dinner time. We go a step further because we have more than a reasonable number of dogs and make enough rice so that there will be some for breakfast as well. We use a 12 quart crock pot (less than $20 at this writing) so there is enough for two feedings. We feed our dogs twice a day as I don’t believe they can get all that they need in just one meal. If you get up a lot at night like I do you can just turn your crock pot to warm some time during the night so that it is ready for breakfast. Is this too much, more than they need? I don’t think so but I know those that would disagree with me and I say to them, then why have the dog. Why buy a dog only to put it in the backyard on a chain? OK, I’ll stop here as anything more would just be a rant and those people would never read this blog anyway. Somebody ought to write a song about livestock guard dogs! Yes I am enamored with these dogs and want to tell everyone, but maybe you already knew about them. Since we are relatively new to the whole farming thing we are still fascinated by what some people have known about for centuries. Working dogs in general are marvelous creatures but to actually be able to work with them is a special experience. If you have read my past blogs you know that we lost many lambs to coyotes before we got these dogs and have enjoyed no losses since. It is very interesting that a domesticated canine can be trained to defend your property from its wild cousin. We are doing something a little different in the way of training though. We I first began to work with the dogs and did my research, I found mostly just books and articles from long ago. What more recent writings I found were still focused on dogs protecting flocks of sheep in vast areas of grasslands. There is still some of this going on but for my purposes, and other farmers like us, we contain sheep on acres of fenced land, often with neighbors nearby. This is a very different environment. While the general job description is the same, the specifics are not and so some of what I was reading did not apply or was not going to work. But what I really wanted and needed was not addressed at all. On a small farm like ours, close to the city, we have a lot of different things going on; diversity is not just a word here and neither is free range. Our dogs don’t just protect our sheep from coyotes, but they protect all that we produce from a variety of different predators. I had to make some significant changes to the traditional livestock guard dog training regiment but it has worked far better than I expected. So we now not only have no more losses of our sheep to predators, but we no longer lose chickens or turkeys or even plants! 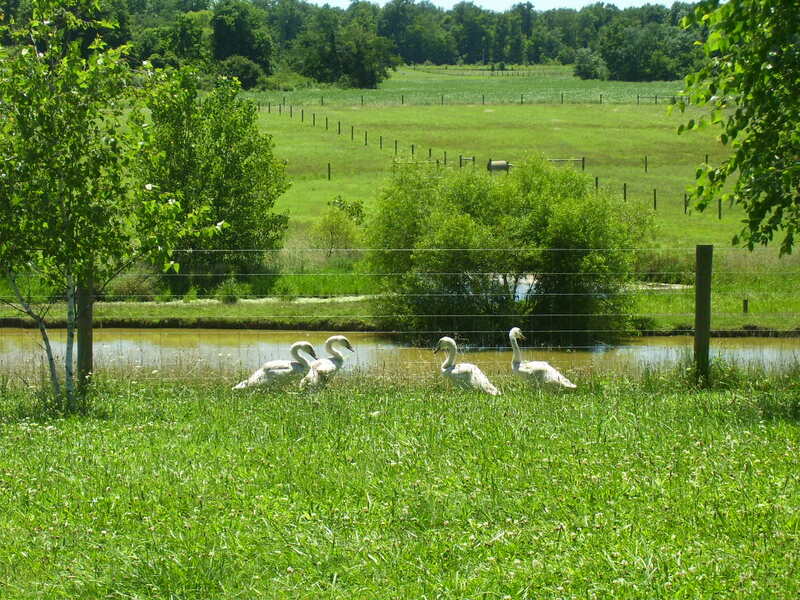 Yes I tell you, even the herons are denied the fish from our ponds and the hawks the ducklings on the ground. We have always had large losses of young birds so we had to steal the day olds from their mothers when she took then from the nest and put them in brooder boxes lest they disappear one by one. What a labor savings to be able to allow the mothers to raise their own young! Here is one of our LGDs, his name is Doodle and he is watching over this sheep as she has her lambs right out in the open. She and her lambs are most vulnerable now but she (and me) need not worry; should something smell what is going on and decide to take advantage, Doodle will sound the alarm and the other dogs will quickly come to help. A custom built bin to hold dry food as part of your kitchen cabinets places the food in easy reach and saves a few steps every time you feed. For us that means feeding 8 dogs and some odd number of cats twice a day and that doesn’t count the extra treats here and there. Here’s a tip, with conscience shopping you can find all meat wieners for $1/lb and that is less costly than dog treats that often have no meat in them at all. We pile on the treats for our outside dogs in the winter to help fend off the cold. The only dogs we keep outside thru the harsh winter months are those that are designed for such a life like our Komondork and Great Pyrenees working dogs. These dogs are amazing; they usually don’t even go to their shelters in weather that would kill the average dog. It is during particularly bad weather that the whole issue of living with your dogs comes to mind. Our dogs don’t care about the cold or the rain or the snow, they don’t like thunder and lightning but even bad winds don’t faze them much. A mud room, if you have one, can be a convenient place for feeding when the weather is bad but you don’t want to hang out there with them and unless you have a dog door in that room for them to get out and do their business you have to clean up more than just the mud. So we need a place with the convenience of a mud room but the comfort of a basement, easy access for you and the dogs while allowing you to retreat to the house while the dogs can move freely outside to earn their keep if they are guardians. The room needs to be warm and dry enough to contain a chair and television or computer, phone, etc., but not uncomfortable for the dogs. The point is that you want the dogs by your side, why else have them? I won’t even go there as that topic will anger me. Anyway, you don’t want carpet of course nor an expensive floor or furniture to worry about because the dogs will often be wet or muddy. You are thinking enclosed deck or patio, right? Absolutely! Maybe a small woodstove to take off the chill and windows all the way around, save money by using translucent plastic for the roof. There are many advantages to this type of construction. Other than basic good building practices, it doesn’t have to meet any particular code, you can do it yourself if need be, it doesn’t have to be completed all at once, some materials may even be salvage like windows for example. This doesn’t mean that this space that you and your animals share has to look like a hovel. A modest deck with pony wall and roof can be architecturally appealing if you use a little imagination. The rest can simply be stretched screen and that can be covered with plastic during the winter months. Surplus windows or glass can be added a piece at a time later. With the proper dog/cat/pot bellied pig door, you shouldn’t have to clean up much poop. Treated decking and outdoor furniture can be sprayed down when necessary. For you bird fanciers this room can also serve as a grand aviary. Why do this, go thru the effort and expense? Well, the truth is that we live in a world where many people do not share our love of animals and there are times when we need to interact with those people. The amount of time that we spend with our animals verses time spent with these other people in our homes should order the partition of the house. Unfortunately I can not build another house nor greatly modify the existing house but if I could it would be partitioned 35% such that the other people would see and 65% where I would spend most of the time. Practically speaking that means two thirds of the house would be Spartan, designed to be easily cleaned and free of stuff.